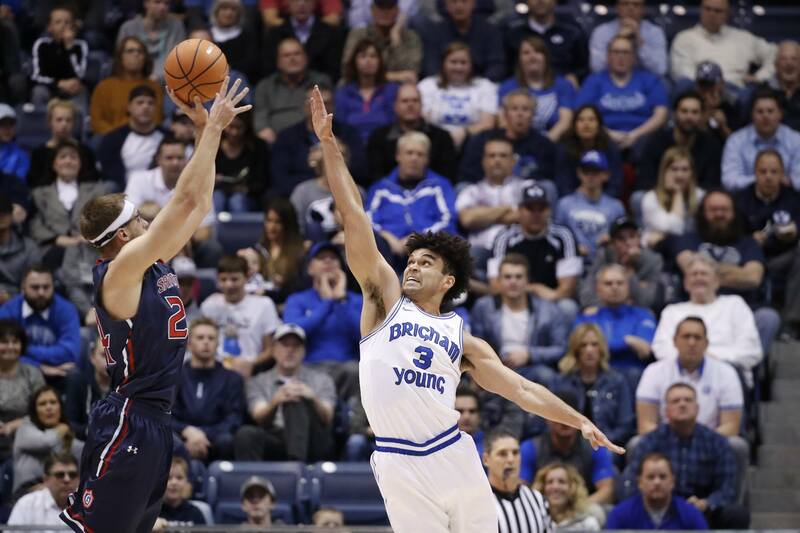 PROVO – BYU fell 74-64 in overtime against Saint Mary’s on Saturday afternoon at the Marriott Center to snap a nine-game Cougar winning streak. 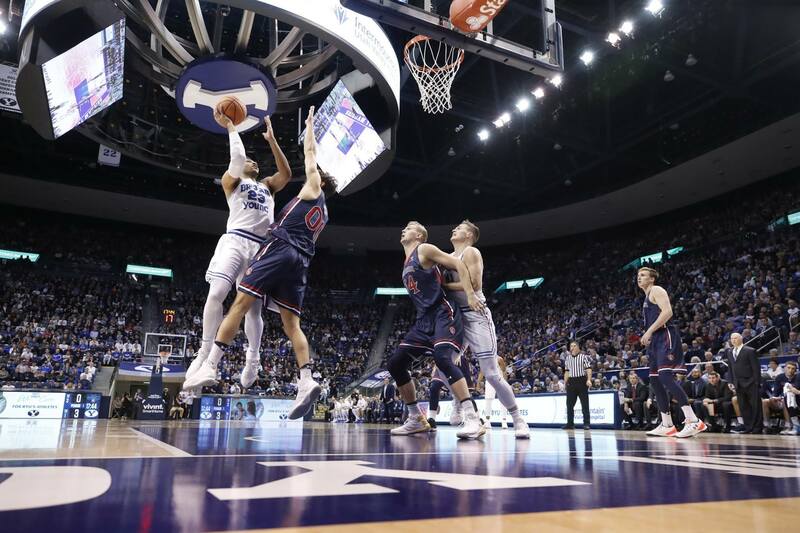 Yoeli Childs scored a career-high 29 points and grabbed 10 boards to lead BYU (12-3, 1-1 West Coast Conference). Elijah Bryant added 16 points. Preseason all-conference player Jock Landale had 35 points and nailed 13 of 15 field goals for Saint Mary’s. The score was tied seven times before the Cougars eventually fell to the Gaels (13-2, 2-0). BYU led 7-5 after five back-and-forth minutes, with four points and three rebounds from Childs. Bryant stole a Saint Mary’s pass and went the length of the court for a lay-in halfway through the first half. On the next possession, Childs buried a hook shot to tie the game at 17-17. TJ Haws hit a 3-pointer with just under seven minutes on the clock to put the Cougars up 22-21. It marked their first lead since going up 7-5. After an 8-0 run, BYU led 29-21 with four minutes left until halftime. The Gaels came back with their own 8-2 run to cut it to 31-29 as the buzzer sounded. Childs and Bryant led the Cougars with 11 and nine points, respectively, at the half. Jahshire Hardnett cut through the lane and lobbed it to Childs, who made a layup and was fouled in the process. He knocked down the free throw to put BYU up 38-30 three minutes into the second half. Saint Mary’s once again cut into the lead and hit a 3 to trail 40-37 and force a Cougar timeout with 13:37 on the clock. Halfway through the second half, Hardnett made it 46-41 with a pair of free throws. A Gael 3-pointer with around seven minutes left in the game made it just a one-point BYU lead. Childs scored on the next possession to tie his career high of 26 points and make it 52-49 for the Cougars. Bryant buried a 3 one minute later for a six-point lead. Saint Mary’s scored on three-straight possessions to lead 56-55 with just over three minutes left. Childs set a new career high with a free throw that tied the game at 56-56. The Gaels answered with a free throw to go back up by one point, and then Childs knocked down two more to put the Cougars up 58-57. Saint Mary’s hit a 3-pointer to lead 60-58 with under two minutes left to play. Out of a timeout, Haws scored on a nice move to the hoop to tie the game. BYU called a timeout with 20 seconds left and the scored tied at 60-60. Zac Seljaas got off a 3-point attempt at the buzzer, but only drew iron to send the game to overtime. The Gaels outscored the Cougars 14-4 in the extra period to win 74-64. BYU plays its first road WCC contest on Thursday at San Francisco. That game begins at 8 p.m. PST and features a live stream on NBC Sports California and radio broadcasts on KSL (1160 AM and 102.7 FM) and BYU Radio (Sirius XM 143). Yoeli Childs scored a career-best 29 points and added 10 rebounds. It was his second-straight double-double, seventh of the season and 12th of his career. Childs has scored in double figures in 13-straight games and 14 times this season. Payton Dastrup tied his career high with two blocks while adding three points and five rebounds. TJ Haws finished with five assists, his seventh game this season with five-plus assists. Elijah Bryant totaled 16 points, three rebounds, five assists and two steals. It was his third game with five-plus assists this season. Bryant has also hit a 3-pointer in every game this season.